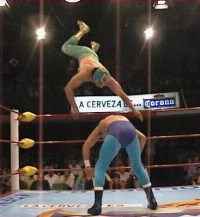 Standard pin, done by jumping over a bent over opponent and pulling them into a rana position. Can be done one the run or by jumping onto the opponent. Opposing luchadors often find themselves trying to sunset flip fat wrestlers, and getting squashed by a big sit. This page was last edited on 11 May 2010, at 09:47.